Up in Hokkaido sits Otaru Beer, a Japanese brewery dedicated to brewing strict German styles. Luckily, you don’t have to visit the little town of Otaru to sample their beers as they are available in central Tokyo. 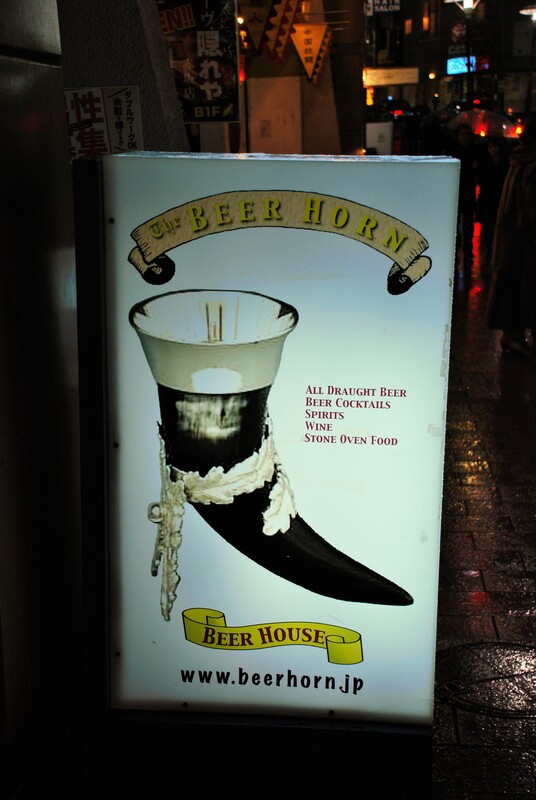 The Beer Horn bar, in Akasaka, serves up Otaru beers in actual animal horns. This was something my friends and I had to experience for ourselves! Down in a basement off of a busy street, Beer Horn looks very old Europe. 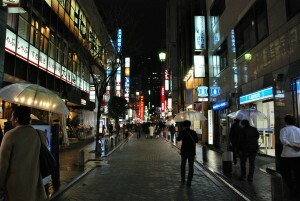 Though it also feels a little bit Old Japan too, with a slightly musty and worn atmosphere. The beers are priced high enough that the All You Can Drink special makes a lot of economic sense. If you are going to drink two or more horns of beer, you may as well pop for the nomihodai. The uniqueness of being in an expansive Tokyo basement slamming back viking sized horns of Japanese produced German styled beer was not lost on us. The experience is quite a bit of fun, but the experience is the heart of it all. The beer is fine, and it’s better than Asahi Super Dry, but it isn’t always really all that fantastic in it’s own right. Places like Devil Craft, BrewDog, and Campion all have better beer available. Though what those venues don’t have is large animal horns to drink out of, with wrought iron stands to keep everything level. There are three basic beers available with the all you can drink, a pilsner, a dunkel, and a wezien. The pilsner was my favorite, malty and well balanced with a bit of hops at the back. The pilsner style is one of the most drinkable in the world, and this version filled the beer horns quite well. We did find one problem with the horns. If a tipsy individual doesn’t stick the landing perfectly the horn will tip over, dousing the other people around the table. I won’t tell who was the drencher and who was the drenchee though. Overall we had a lot of fun at Beer Horn. 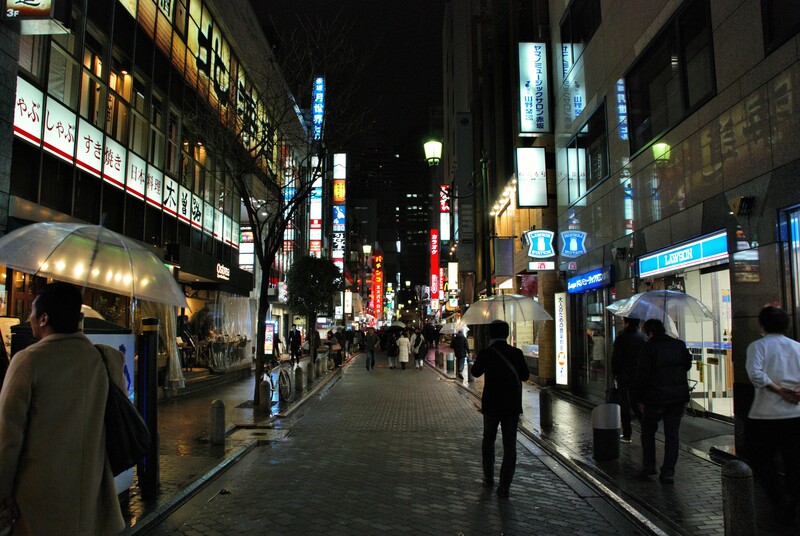 I don’t think it would ever be in my regular Tokyo rotation, but it was worth at least one trip for sure. Have you ever been to Beer Horn? What did you think? 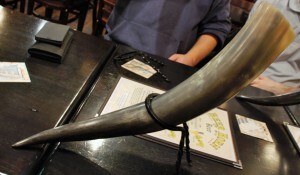 Have you found any other places that serve beer in actual Valhalla style horns? Let me know in the comments! This entry was posted in Bar Guide, German Beer, Japanese Beer and tagged Akasaka, All You Can Drink, Beer Horn, Lager, Tokyo. Bookmark the permalink. Baird Beer: Best in Japan?